10 of Texas’ overlooked state parks. ﻿﻿﻿﻿﻿﻿﻿﻿﻿Texas state parks make up a sprawling spider web of more than 90 sites stretching from Amarillo to Brownsville and El Paso to Sabine Pass. 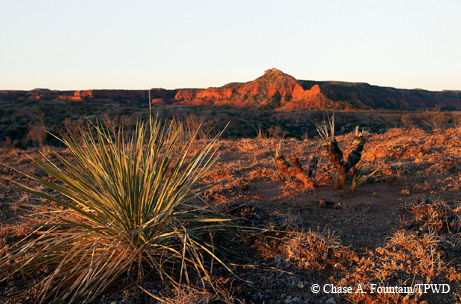 Most of us have frequented or at least heard of iconic parks like Bastrop, Garner, Palo Duro Canyon and others. But what about the lesser-known, unpolished gems in remote pockets of Texas just begging to be discovered? Whether you’re looking for an off-the-beaten-path spelunking adventure, a glimpse of prehistoric Texas, a place for your kids to see a longhorn or bison, the perfect spot to pitch a tent beneath starry skies or simply a peaceful refuge from frenetic urban life, the following 10 unsung state parks have you covered. Texans unfamiliar with East Texas’ otherworldly Big Thicket should spend some time exploring the primitive forests and backwater sloughs within this Southeast Texas park to lose themselves in a world of carnivorous plants, slithering reptiles, flitting birds and hundreds of flowering plants. 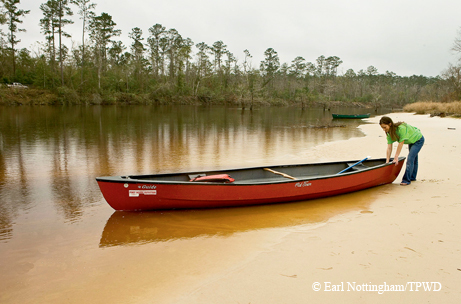 Park visitors can take in the primitive sights and sounds of the Big Thicket by paddling the new Village Creek Paddling Trail that begins at FM 418, meanders through a riparian wonderland and ends at the state park takeout. Rent from an upstream concessionaire or bring your own kayak or canoe, grab one of the several dozen shaded campsites and spend the day paddling the tea-colored waters before kicking back around a cozy campfire. Book way ahead of time if you’re planning to “rough it” in the bluff-top, climate-controlled, eight-person cabin. For more information, call (409) 755-7322 or visit www.tpwd.state.tx.us/villagecreek. Tucked into the hardscrabble Lower Pecos River canyonlands just below the confluence of the Rio Grande and Pecos River, Seminole Canyon State Park & Historic Site provides compelling insight into 12,000 years of Texas history. Most travelers stop by the 2,172-acre park to see the mesmerizing 4,000-year-old Native American rock art. Multihued and polychromatic blood-red and black pictographs of shamans, animals and other fantastical figures can be found on the walls of Fate Bell Shelter. Stop by the visitors center to view exhibits about the region’s unique natural and cultural resources, as well as dozens of Lower Pecos artifacts. A new video provides an overview of the pictograph sites within the park and touches on present efforts to preserve the pictographs. You can also discover the park’s link to late 19th century black Seminole Indian scouts and the 1880s Transcontinental Railroad. The park offers more than 10 miles of hiking and biking trails, including a recently opened segment that skirts the canyon rim and offers breathtaking views. Campers can choose from among 23 water-electric campsites, eight water-only tent sites and 15 primitive sites. A restroom with showers is available. For more information, call (432) 292-4464 or visit www.tpwd.state.tx.us/seminolecanyon. “The stars at night are big and bright, deep in the heart of Texas.” The opening lines from this 1940s hit tune could be the anthem for this remote state park, known for its impossibly clear skies. Star walks are one of two major draws at Copper Breaks, which is decidedly NOT located in the heart of the state, but rather a half-hour drive from the Oklahoma border. A “Meet the Longhorns” program proves a popular Saturday diversion as well. Visitors who do travel to this remote, 1,900-acre park just below the Panhandle caprock are rewarded with what looks like a classic badlands scene from a Western movie. You almost expect to see Comanche or Kiowa scouts patrolling the cedar brakes and low hills streaked by gray-green veins of copper. The park’s museum documents the area’s Native American legacy, which includes the story of kidnapped Texan Cynthia Ann Parker’s recapture by U.S. troops during the nearby 1860 Battle of the Pease River and the ascendance of her son, Quanah, to Comanche chief. Indian and cowboy artifacts lend a decided air of authenticity to exhibits. Ten miles of multiuse trails, two lakes and 46 campsites serve as additional reasons to make the trek to this off-the-beaten-path park. For more information, call (940) 839-4331 or visit www.tpwd.state.tx.us/copperbreaks. No need to pack up the family for a trip to Yellowstone National Park this summer to get a close-up look at an icon of the American West. Just point your minivan or SUV toward the Texas High Plains to Caprock Canyons State Park, about 100 miles northeast of Lubbock. The last remnants of the historic southern plains bison herd, protected by rancher Charles Goodnight in the 1880s, roam 700 acres of restored grasslands inside the 15,300-acre park. They are part of the official Texas State Bison Herd. Seeing the shaggy beasts alone is worth the park’s $4 admission, but Caprock Canyons also boasts a wealth of outdoor opportunities amid spectacular scenery. Check out an audio driving tour guide before descending into the park canyons. Visitors can swim or fish at Lake Theo and stay at one of more than 100 campsites, ranging from campgrounds with full hookups to primitive backcountry sites. Tackle more than 28 miles of trails shared by horseback riders, hikers and mountain bikers or head out to the 64-mile Caprock Canyons State Park Trailway, stretching from the plains atop the caprock to Estelline in the Red River Valley, passing through Clarity Tunnel and crossing 46 bridges. For more information, call (806) 455-1492 or visit www.tpwd.state.tx.us/caprockcanyons. First impressions can be deceiving for first-time visitors to this scruffy and remote Southwest Texas park that lies at the intersection of the Chihuahuan Desert, Edwards Plateau and South Texas plains. Much of the park’s magic lies beneath the surface in 20 known caves. The largest and only cave open to the public is the namesake cavern, accessible through guided flashlight tours every other Saturday. Advance reservations are highly recommended and can be made by calling the park. Couch potatoes need not apply for the two-hour tour of this 4-million-year-old subterranean wonderland filled with trickling water, giant boulders and bizarre-looking, dissolved-limestone formations. 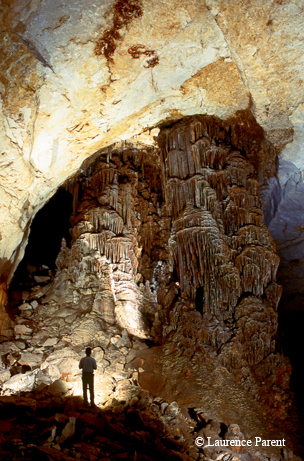 Check out the state’s largest speleothem — 80-foot, twin crystalline calcite columns. Regular access to the 6,300-acre park became available on June 1, 2010, after more than 20 years of restricted park access to what was formerly the Seargeant Ranch. The park is open four days a week, Fridays through Mondays. From March through October, visitors gather at dusk in front of Stuart Bat Cave to watch Mexican free-tailed bats emerge to forage for insects. Eighteen miles of trails accommodate birders, hikers and mountain bikers. Birders have recorded more than 240 bird species, including the endangered black-capped vireo and golden-cheeked warbler. Be sure to climb the Seargeant Memorial Lookout Trail located right behind the park headquarters for a bird’s-eye view of the park. 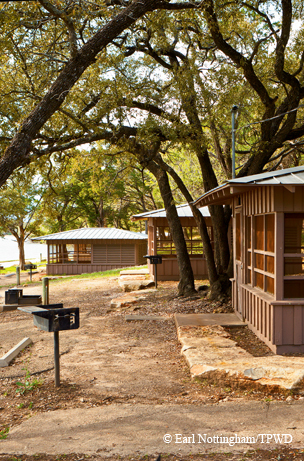 Campers can choose from 20 campsites, including 15 in the main campground, which has restrooms and showers. For more information, call (830) 563-2342 or visit www.tpwd.state.tx.us/kickapoocavern. Like a well-fed 5-year-old, this World Birding Center site is enjoying a tremendous growth spurt, as nature lovers from near and far discover its natural bounty. Since opening in 2006, the park has grown from 146 to 230 acres and become one of the top birding destinations in the feather-crazy Rio Grande Valley. It is the buckle on the belt of nine WBC sites strung along 120 miles of the Rio Grande. feeling forests of sabal palm, Texas ebony, bald cypress, anaqua, cedar elm and acacia. Fourteen-passenger trams cruise a network of park roads to provide visitors with excellent opportunities to view occasional rare birds, as well as specialty birds such as the common pauraque, great kiskadee, Altamira oriole and plain chachalaca. Trails, lakeside observation decks and boardwalks (some wheelchair-accessible) provide an intimate wildlife-viewing experience. For more information, call (956) 565-3919 or visit www.theworldbirdingcenter.com/estero.html. Fort Richardson personifies a hybrid site in the Texas state park system. It is both a recreational park and a historic site that played a crucial role in Texas’ post-Civil War Recon­struction and Indian Wars. Established as an “occupational fort” by the U.S. Army in 1867, the northernmost fort in a chain of frontier citadels, Fort Richardson served in the early 1870s as a staging site for Col. Ranald MacKenzie’s campaign against Native American raiders from the Fort Sill, Okla., reservation. His troops’ victory in the 1874 Battle of Palo Duro Canyon ended southern plains Indian hostilities. Immerse yourself in frontier history by touring the showcase fort hospital, the commander’s quarters and other original restored buildings and ruins. Fort grounds are open to both self-guided walking tours and guided daily interpretive tours. The fort’s location on scenic, wooded Lost Creek and nine miles of multiuse trails afford ample opportunities for picnicking, fishing, hiking, horseback riding and nature study. Look for red-eared sliders and other wildlife along the creekside nature trail or look for birds along the new quarter-mile Kicking Bird Trail. The 10-mile Lost Creek Reservoir Trailway invites longer excursions. Campers can choose from 53 campsites accommodating tent campers and RVers alike, as well as 11 screened shelters and five new equestrian campsites. For more information, call (940) 567-3506 or visit www.tpwd.state.tx.us/fortrichardson. Today’s Texans should heed the Texian Army’s fevered cry of “Remember Goliad!” at the Battle of San Jacinto and remember to visit this fascinating site. Goliad State Park’s 188 acres encompass three historical sites along the San Antonio River. 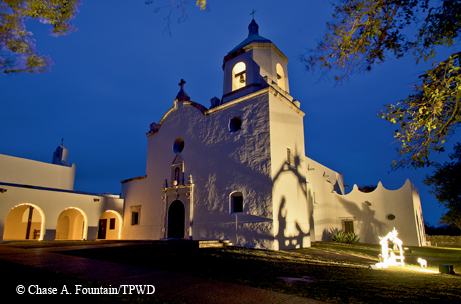 Start with a tour of the gleaming white stucco Mission Espiritu Santo, established in 1749 to “civilize” the Native American tribes. Four camping areas and access to a 6-mile hike-and-bike trail and the Goliad Paddling Trail complete the package. The recently renovated mission offers glimpses into pre-colonial and Spanish colonial history dating back some 300 years. Take a guided tour of Espiritu Santo’s scenic grounds, historical exhibits, picturesque chapel, granary and workshops. Two other historic sites — the remnants of Mission Rosario (four miles west of Goliad) and Zaragoza’s Birthplace (a half-mile south of the park adjacent to Presidio La Bahía) make up the rest of the park. Nearby stands the Fannin Memorial, commemorating the 1836 execution of Col. James Fannin and 341 of his captured Texian troops by Mexican troops during the Texas Revolution. The word is getting around, too, about the park’s plentiful wildlife and wildflowers, colorful birds, wooded campsites, screened shelters and large swimming pool. For more information, call (361) 645-3405 or visit www.tpwd.state.tx.us/goliad. This diminutive refuge built by the Civilian Conservation Corps in the 1930s beckons outdoor enthusiasts with a host of recreational amenities. Most park activity centers on the clear, 72-acre, no-wake lake that is popular with swimmers, anglers and paddlers. A scenic 5-mile road traverses several picturesque spots, including the Bee Ledge Overlook atop a 50-foot limestone bluff. In the Shinnery Ridge West Campground, tent campers will find several lakeside campsites ideal for kicking back in solitude or launching a canoe or kayak. The 500-acre park northwest of Waco offers 50 campsites, catering to everyone from the primitive tent camper to RVers seeking electricity, water and sewer hookups. Popular, too, are the park’s screened shelters, six of which are lakeside shelters next to the handsome old stone refectory. Also available are a large air-conditioned and heated dining hall ($150 a day) and a new primitive group campground, Cottonwood Cove. Anglers seeking to hook catfish, bream and bass can fish on the lake or cast from the end of a 70-foot ADA-accessible pier. Hikers and birders will enjoy the 5-mile trail system circling Lake Meridian that cuts through a mix of riparian forests, cedar and oak woodlands and limestone escarpments. Try the 1.64-mile Shinnery Trail loop for a possible rare sighting of the endangered golden-cheeked warbler. For more information, call (254) 435-2536 or visit www.tpwd.state.tx.us/meridian. A glassy 355-acre lake proves the main draw at this park, tucked into the post oak belt between Tyler and Dallas. Anglers catch and release ShareLunker-sized black bass and take home large catfish and crappie for the dinner table. Like all state parks, Purtis Creek requires no fishing license. Other popular recreation pastimes at the 1,582-acre park include picnicking, hiking, wildlife watching and camping. Stroll the Beaver Slide Nature Trail to see post oaks up to 300 years old or tackle the new 4.3-mile Wolfpen trail system, popular with serious hikers and mountain bikers. Overnight guests can choose from primitive backpack or boat-in sites, water-only tent sites and 58 water-electric sites. Day visitors can relax at dozens of shaded picnic tables while youngsters hit the nearby playground. For more information, call (903) 425-2332 or visit www.tpwd.state.tx.us/purtiscreek.